Our families have been in the business of egg farming for generations. And we've been successful - not just because of our product, but because of our commitment to an open, honest relationship with our customers and the public. When our families reopened Centrum Valley Farms, we recognized that doing more than is expected of us would have to be the standard for these farms. That's why our eggs come from a team that is committed to food safety, environmental protection and responsible on-farm practices. 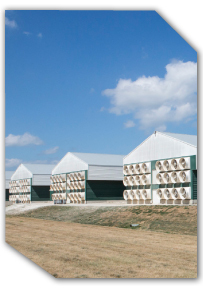 Our farms strictly follow comprehensive agreements overseen by FDA related to both disease prevention and Salmonella testing - the highest standards applied to any egg farm. Our environmental testing and compliance procedures are over and above those required by FDA's Federal Egg Rule. We have brought onto the farm a dedicated team focused on egg safety. 16 team members are HACCP-certified. 13 team members are SQF-trained. New management teams are in place to oversee compliance with environmental, animal care, regulatory programs and disease prevention as well. Buying and eating eggs produced at Centrum Valley Farms is one that can be made with confidence - and with our reassurance that we are committed to doing what's right at all times on these farms. Our team works each day to produce the safest, highest-quality eggs available on the market today.